The opening class of the Longines Global Champions Tour of Mexico City kicked off with a win for Eduardo Alvarez Aznar (ESP) and a tantalising look at the form of top riders and horses at the event. 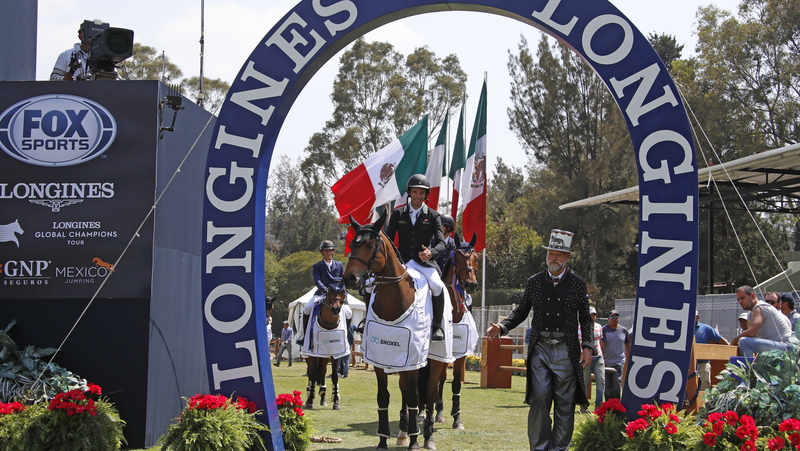 Ahead of today’s GCL Round One, the early two phase Broxel Trophy competition was a good indicator of which combinations would pose a formidable threat in both the team and individual showdowns in the Mexican capital. There was a strong performance from Peder Fredricson (SWE) and H&M Christian K, but US champion Laura Kraut quickly took the lead with Curious George in a time of 28.61. The high calibre Americans were impressive with Beezie Madden and Darry Lou trumping Laura’s time to finish in 26.83 propelling her into the lead for most of the competition. There were also impressive performances from the Belgian contingent with Olivier Philippaerts (BEL) and Cataleya, Jos Verlooy (BEL) and Caracas and Constant van Paesscen and Isidoor van de Helle all putting up serious challenges. But it was Spanish star Eduardo Alvarez Aznar took advantage of his talented big striding horse Uqualin du Saulcy and stopped the clock in 26.32 putting Beezie into second place.